Winning ladies: At the Yew Tree Ball were Sr. Maureen Lally (Mayo Person of The Year) and Michaela Walsh (Mayo Young Person of The Year). Photo: Paul Sherwood. A sparkling black tie affair last Saturday night in the Ballsbridge Hotel, Dublin, saw the Mayo Association Dublin celebrate its annual awards gala, rebranded this year as The Yew Tree Ball. More than 500 guests attended in glamorous style to honour the 2018 award winners. Arriving guests were treated to a red carpet prosecco reception as well as a stylish Conncullin Gin bar, generously sponsored by the Connaught Distillery, before being seated for a four course meal. Chairperson of the association, Julie Doyle, thanked all the sponsors and those in attendance for making it a wonderful evening: “We are very grateful to all our guests, our sponsors, and raffle prize givers for their overwhelming support of the rebrand of the premier event of the association. The Ballsbridge Hotel was transformed into a sea of green and red with the awards ceremony being presided over by the PRO Bernardine Walsh. The event included a raffle of more than 50 prizes worth some €10,000 generously donated by businesses in Mayo and Dublin. The association chose Mayo Mental Health Association as its charity partner on the night, and guests were shown a video of the important work MMHA does in the county, with the proceeds of the bumper envelope draw going to that worthy cause. Sr Maureen Lally was honoured as the worthy winner of the Virginia Gallagher - Mayo Person of the Year award. She was presented with the award by the chairperson, Julie Doyle. The Islandeady native is an indomitable figure who has worked hard to stem the decline of rural and agricultural life in the Tochar Valley Network. Dr Shari Dann from Michigan State University, with whom Sr Maureen had worked to pioneer the rural network, travelled from the US to celebrate with Sr Maureen on the night, such was her admiration for the winner. John Gallagher from Belmullet, the chairman of Comharchumann Forbartha Ionad Deirbhile, accepted the Meitheal Award sponsored by Connolly Motor Group on behalf of the local group for their efforts in the R116 rescue. Michaela Walsh from Swinford added another medal to her growing collection. 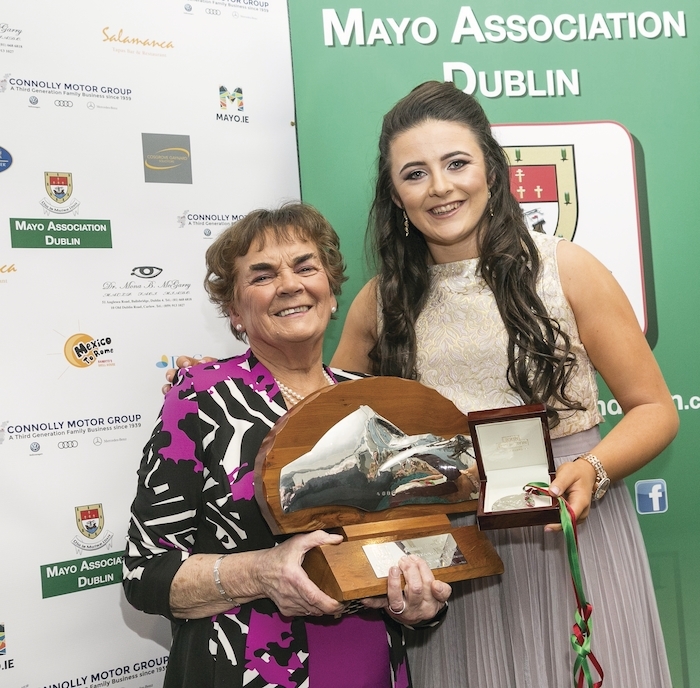 The 18-year-old athlete was awarded the Young Mayo Person of the Year Award by the president of the association, Dr Mona McGarry, who also sponsored the award. She presented Michaela with a bursary cheque for €1,000. Last year Michaela won a bronze medal in the U20 European Championships in the hammer throw.